I LOVE IT! If that is a magnetic rack, you could cut it where the colony has not encrusted it and make it part of your aquascape - you could then hang it from the back wall. You got all the points perfectly. Also acclimate livestock before putting them in whatever tank they will be in. Thanks Snow. I have a Red scooter and now also a Target Mandarin in my tank. They both eat prepared foods. I do throw in pods and live black worms as well but not with any frequency. I did not know if the scooter would eat prepared foods so he spent many months in a small fuge picking on pods till I hand fed mysis a few times and he gobbled it up. The Mandy was eating mysis at the store when I got her. Yeah - your first frag was a beast Wow, post a picture? Feels good to be painting again. I've missed it. It tends to do that to gain surface area and will then shoot up. How long has it been since it started encrusting? Hi there - it was great to meet you too!! Stay in touch. Congratulations, love the fluffy gorgonians. And the cat, what a cutie. Will miss you. 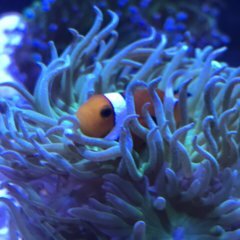 And the Santa hats on the clownfish.